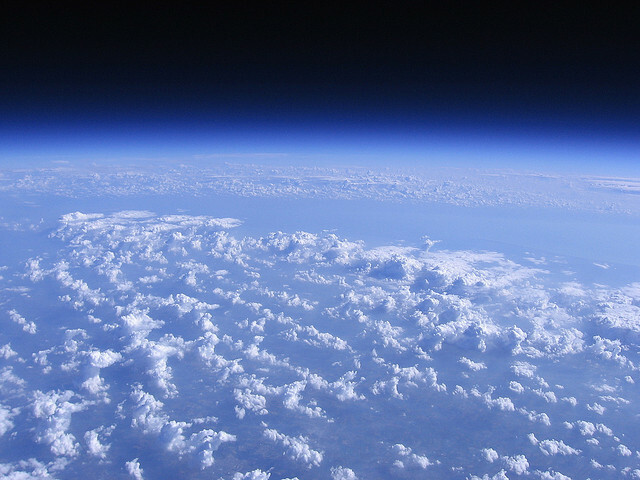 Most pictures of the earth taken by amateur balloonists at very high altitudes are not doctored. Flat Earth Theory holds that there is elliptical curvature from the edge of space. Any photograph showing a curved elliptical horizon from very high altitudes poses no affront to FE. Curvature results from the fact that at the edge of the atmosphere we are looking down at the illuminated circular area of the sun's light. The observer is looking down at a circle. A circle is always curved in two dimensions. When looking down at the circular area of the sun's light upon the earth we see elliptical curvature. Why can't we see all of the continents of the earth from the edge of space? Although the observer is looking downwards at the circle of the sun's spotlight, the distant continents of the earth are still thousands of miles away horizontally from the observer, and thus beyond the resolution of the human eye and merged with the line of the horizon, squished into indiscernibility and faded with the thickness of the atmosphere. This is why the view is limited to the immediate vicinity below the observer, and why the land fades into a blueish fog as it recedes. The far distant horizon, upon which all is squished into imperceptiveness, is only sending light from which the rays of the sun reach. The darkened areas around the curve is night. We can confirm that we are looking down at the sun's circle of light upon the earth by noting that shots from amateur high altitude balloons show an elliptical horizon. If the earth were a globe, curving downwards in three dimensions, all curvature seen in photographs would appear as an arc of a circle. However, curvature does not appear as an arc of a circle. The Earth is elliptical in all amateur photographs. A striking indication of a Flat Earth. "On the summit I felt a mixture of apprehension and curiosity. Our only comments to each other after initial congratulations were about the fact that the summit is precisely half way. It seemed to me that the curvature of the earth was apparent, and I spent some time trying to think of a means to test if this was a real observation or an illusion. In the end I decided it was an illusion, but it was a strong illusion. Overall my main feeling was of surprise. I am often surprised by the situations that I find myself in." This page was last modified on 5 November 2018, at 18:50.